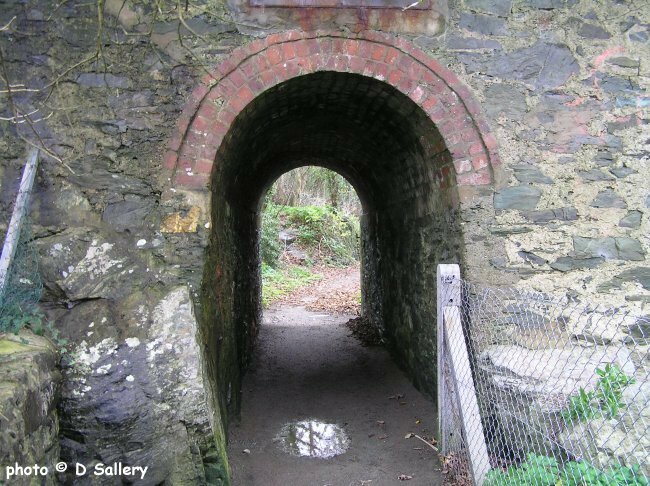 This brickworks, also known as the Afon Wygyr after the nearby river, was opened in 1907 by local landowner Lady Sarah Hughes-Hunter as the demand for bricks grew due to the growth in the tourist industry. However it is quite likely that a smaller works existed on the site before that date. 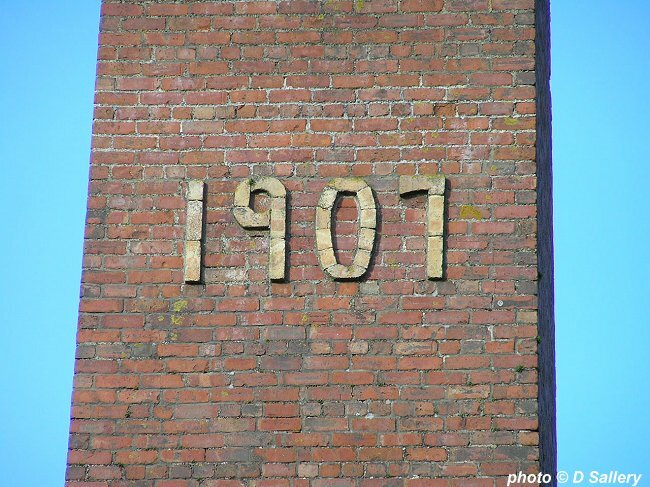 The works had a very short life as it was only in operation until the outbreak of the First World War in 1914. The kiln is a refined version of the Hoffman type, first patented in Germany in 1858, and which became known as a Manchester kiln. It took the form of two parallel tunnels connected by curved sections at each end. The 92 foot chimney stack was outside the kiln structure proper. The tunnels were divided into 16 chambers and once lit the sequence of operations was continuous, new chambers being lit as earlier ones cooled. 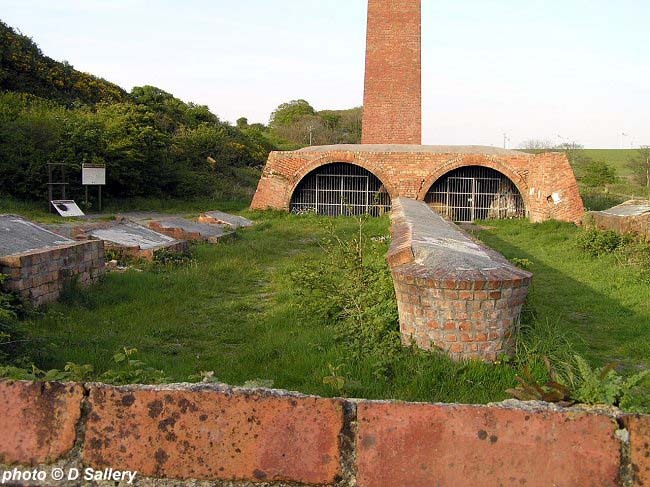 The kilns had the capacity to produce 50,000 bricks per week, a figure that was probably seldom reached. 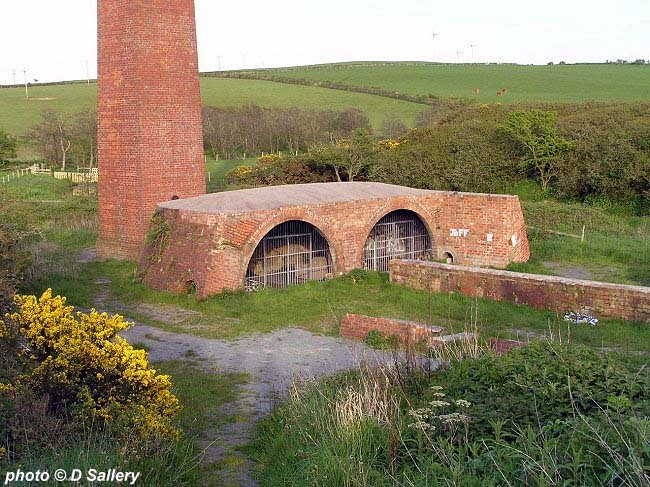 The brickworks site was partially restored by Anglesey County Council in 1998. 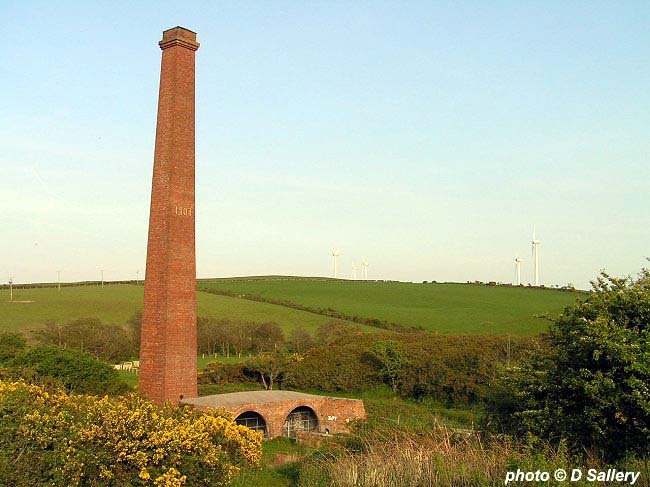 The chimney is clearly visible from the A5025 just east of Cemaes Bay and a path leads down to the works. A tramway, of 2 foot gauge and about 500 metres long, was built from the harbour to the works to bring in coal and take out the finished bricks. 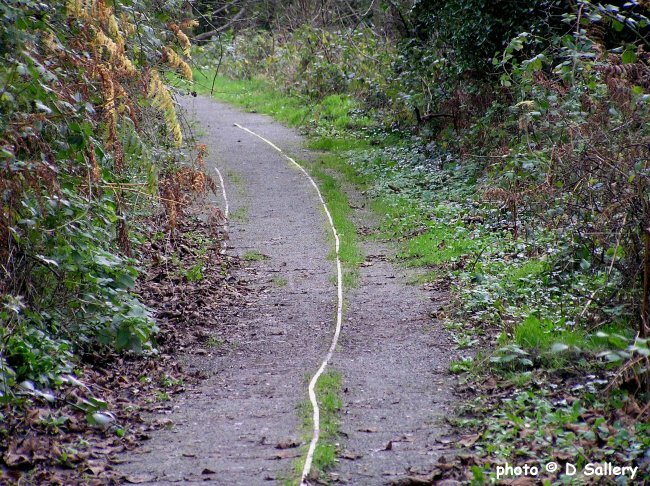 Most of the trackbed was made into a footpath in 1976 and about 50m of track is still in existence on this path. The tramway had no locomotives and the wagons were man or horse hauled to and from the harbour wharf. A report from 1926 records the existence of 7 coal trucks and 6 brick trucks still on the tramway. In 1954 it was planned to reopen the works but testing of the clay discovered too much lime in it and the idea was abandoned. 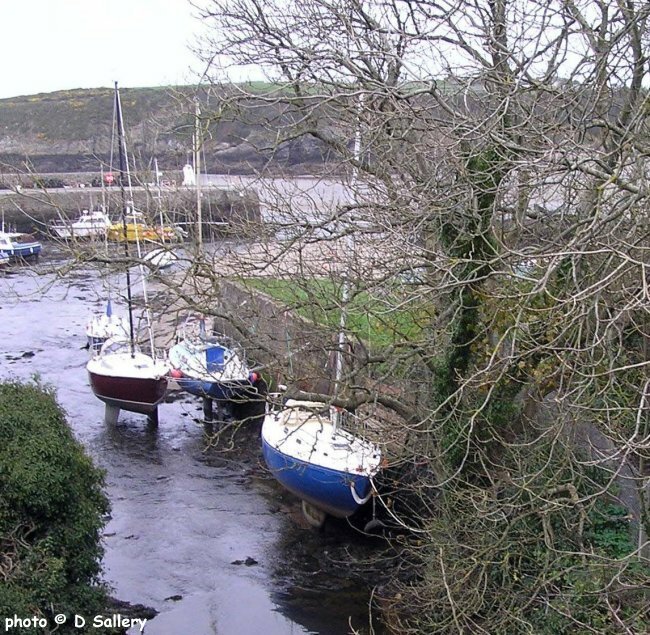 Much of the above information comes from the Cemaes Bay Heritage Centre which also has many other views of the surrounding area. Only part of the Hoffman kiln remains. 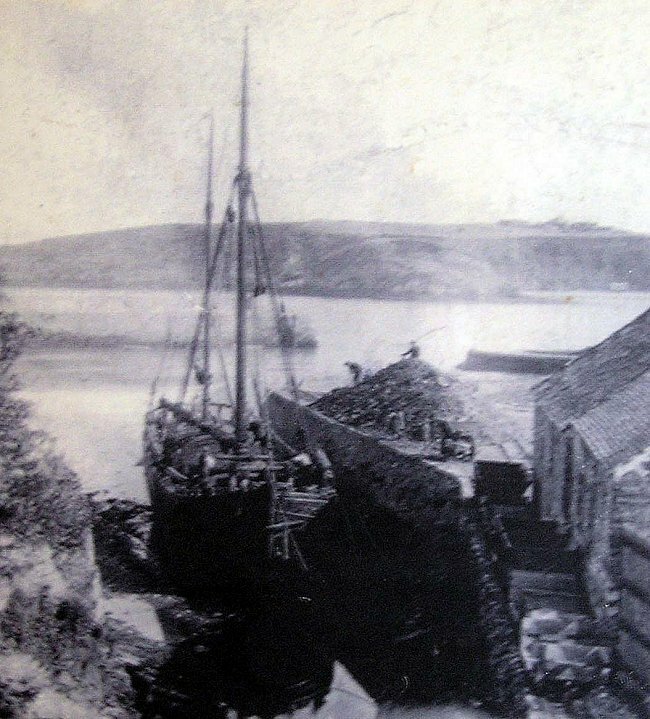 The wharf, with a sailing ship which has just brought in a cargo of coal. Tramway wagons await loading on the right. This tunnel marks the start of the route to the works. 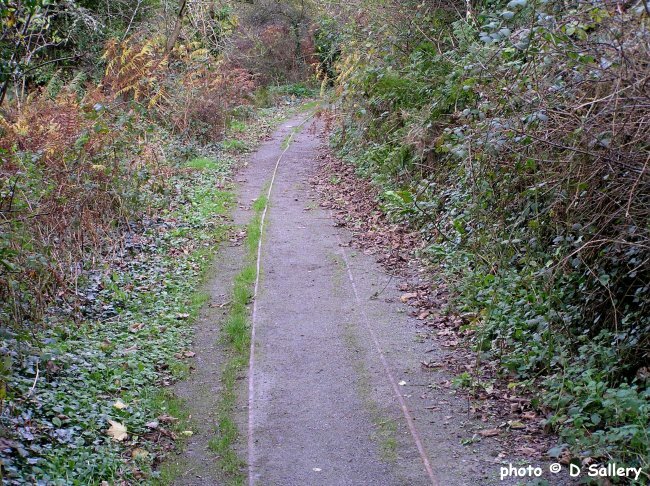 Some of the tramway rail embedded in the footpath.